Frosted Willow is a fantastic Etsy shop specializing in a wide selection of bangle bracelets and sets, with a little something for everyone. From the bold, to the dainty, an eclectic taste is represented. Every piece is an original creation, handcrafted with love. You can find Charm Bangles, Name Bangle Bracelets,Vintage Glass Bangle Bracelets and so much more! 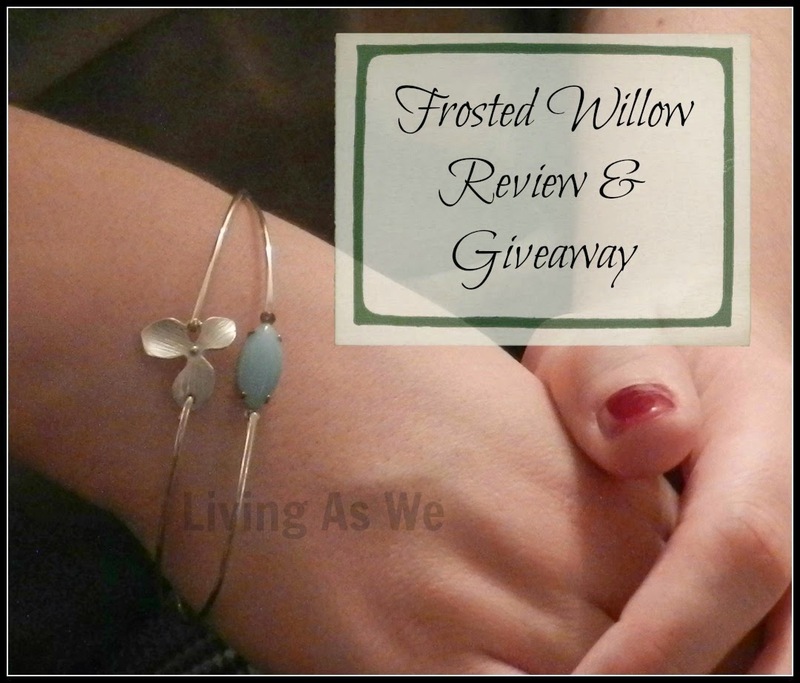 I was sent four stacking bangle bracelets to review, and I was so excited! There were so many to choose from, and it took me a long time to scroll through the amazing variety that is offered. I had a lot of trouble choosing because there was something that spoke to every side of my personality. There was something for the elegant side, the bold side, the boho side. You name it. Before I finally decided on the four pictured on the left, I was also thinking about either of these two. I have always loved dragonflies. They seem so free, so I felt like that choice was appropriate for my personality. The orchid and the vintage turquoise stone bracelets looked so good next to each other that I knew those would make the cut. The last one, the more antique-looking bracelet of the bunch, really stood out to me. I can't quite put my finger on why. I think it might be the intricacy of the design, since normally I prefer something a tad more minimalistic. These are closed bangle bracelets so I found it very helpful that the wonderful lady behind Frosted Willow, Katrin, has a sizing guide available. You just measure a bangle bracelet you already have, or the circumference of the widest part of your hand. Though, I found that I measured a little too true to fit and my bracelets were a little hard for me to get on. When you are taking your own measurements I would suggest not pulling the measuring tape too tight. I had a lot of fun mix and matching different combinations to get the look I wanted. 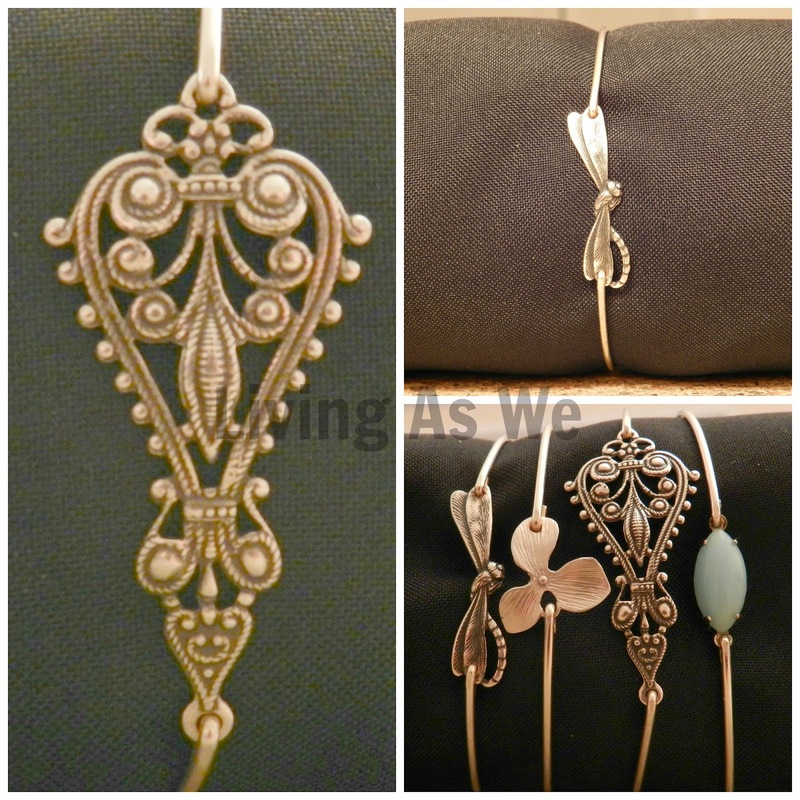 Each bangle looked beautiful on its' own, but when I put certain pairs together it only enhanced each design. The orchid and the dragonfly were very fitting, and I liked that even when they are put together it still looks simple. I don't often go for things like a flower charm, but it was nice to tap into that side of me for a change. I feel like these would be great for a casual look or to be dressed up. I'm especially excited to wear these out with a feminine, flowing spring dress (again something I don't do often). My favourite bracelet was the one that spoke to me the loudest. The antique-y one. It reminded me of one of those old spoons that my mom and dad used to collect when I was younger. I would admire them from my side of the frame, looking but never touching. Now it's kind of like I get to wear one reincarnated around my wrist. I love that this design is something far different from what I would normally be drawn to. I appreciate that while browsing, I could spot something for almost everyone I know and their individual tastes. With each bracelet costing only about $15 on their own, or around $40 for a set depending on the set, I would say that the prices are very affordable. I have no problem paying for little works of art such as these, especially when I know each is originally designed, and carefully handcrafted. There are even sections dedicated to earrings, necklaces and bridesmaid/bridal gear. To top it off, when you order multiple pieces, you only pay shipping on the first item you order. I love this shop, and will definitely be keeping Frosted Willow in mind for special occasions. You can stay connected with Frosted Willow for new designs, sales and future promotions on Etsy, Facebook and Twitter. Katrin has offered to giveaway this set of bangle bracelets to one lucky Living As We reader. Eligibility: Worldwide, 18+ (excluding Quebec). Rules: See Rafflecopter for terms and conditions. I love the orchid flower necklace! So elegant!! So beautiful it's hard to pick only one. I love the Swallow bangle. I like the Double Wing Bracelet. Id also love a nameplate with my sons name or one of the initial bracelets. I liked the infinity bracelet and the Zodiac charm bracelet. I LOVE the swallow bracelet, but I love the birthstone ones as well. I really like the Set of 3 Gemstone Bracelets, Purple Amethyst Bracelet, Blue Topaz Bracelet, Green Apatite Bracelet, 14k Gold Fill Bangles, Gemstone Jewelry! I really like the Skeleton Key bracelet. So many beautiful items! I would love to own the Brass Bangle Bracelet, Nina! I like, among others, the Celtic Knot Bracelet. I love the Autumn in New England, Forest Bracelet Bangles, Forest Jewelry, Fall Foliage, Thanksgiving Jewelry, Fall Leaf Bracelet Set, Autumn Fashion. Simply beautiful! I love the Dark Purple Bracelet with a vintage dark purple oval rhinestone in a brass setting. I really like the elephant bangle bracelet. I like so many of the beautiful bracelets, but especially the Sand Dollar and the Silver Wedding Lace Bracelets!!! I love the Queen Bee set,it is gorgeous! I would love to have the Aqua Green Seafoam Chalcedony Bracelet. I like the Olive Branch Bracelet in silver. And The Little Seahorse in the Blue. I really like the Mermaid Bracelet. I love the queen bee set. The Gold Lace Bracelet is really cute. The Double Initial Heart Bracelet is really neat and would be great for a bride. I like the Bat Bangle - Silver, Bat Bracelet, Animal Bracelet, Animal Bangle, Animal Jewelry, Halloween Bracelet, Halloween Jewelry, Bat Jewelry. I would love to have the Personalized Infinity Bracelet with Initials. I was going to suggest an infinity idea, and it is already done, no other suggestions. I'd love to also get the Beach Jewelry, Shell, Seahorse Set! I love the owl bracelet! How fun and stylish! I love all the jewelry! Guess who's going etsy shopping! I like the Silver 4 Leaf Clover Bangle. I would love the green onyx bangle. The nautical bracelet set is lovely. Perfect for my anchor print dress. These are all really pretty. I like the Aqua Green Seafoam Chalcedony Bracelet. I'd love to see her do more turquoise jewellery in the future. I like the Bohemian bangle bracelet. There are quite a few cute options. I love the initial bangles! 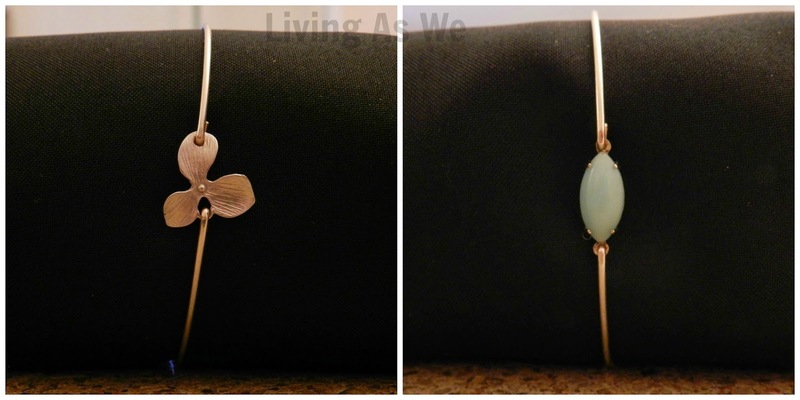 I love the aqua green seafoam bangle or the nautical bangle set! I adore the Queen Bee Gem set. I like the Angel Wing Bracelet. My favourite is the Silver Sparrow, it is gorgeous! I like the Custom Name Bracelet in Gold. The infinity birthstone ring would be so great for my new granddaughter. Beautiful pieces. I would like to have something to symbolize my three kids and the loss of my son. Thanks for making this giveaway open to Canadians and for posting this giveaway to my weekly giveaway linky (http://www.journeysofthezoo.com/category/giveaway-linky). I like Under Mother's Wing bracelet. My mom loved birds, we had 6 growing up..and she said when she died to wanted to come back as a bird. Funny too, I find feathers in the strangest places, and I think it's her way of telling me she is always with me. I love the Morning Dew bracelet set. I love the Olive Branch bracelet! Beautiful! I love the Personalized Starfish bracelet! I really like the Aqua Green Seafoam Chalcedony Bracelet! The simple one at the very top. I like the gold Feather Bangle Bracelet. I love the free as a bird stacking bangles. I love the seahorse and swallow bangles. I like the sparrow bangle bracelet, so pretty. 4 Gold Filled Infinity Bracelets with 1 initial charm each is my favorite. Shooting Star Bracelet set is gorgeous as well-and I LOVE the Olive Branch with initials. I like the Filigree Bangle Bracelet Maylana - Gold. I really like the Olive Branch Bracelet. Lovely! The sanddollar charm bracelet is also just lovely! I really love the owl and olive branch bracelets. They are all so lovely. 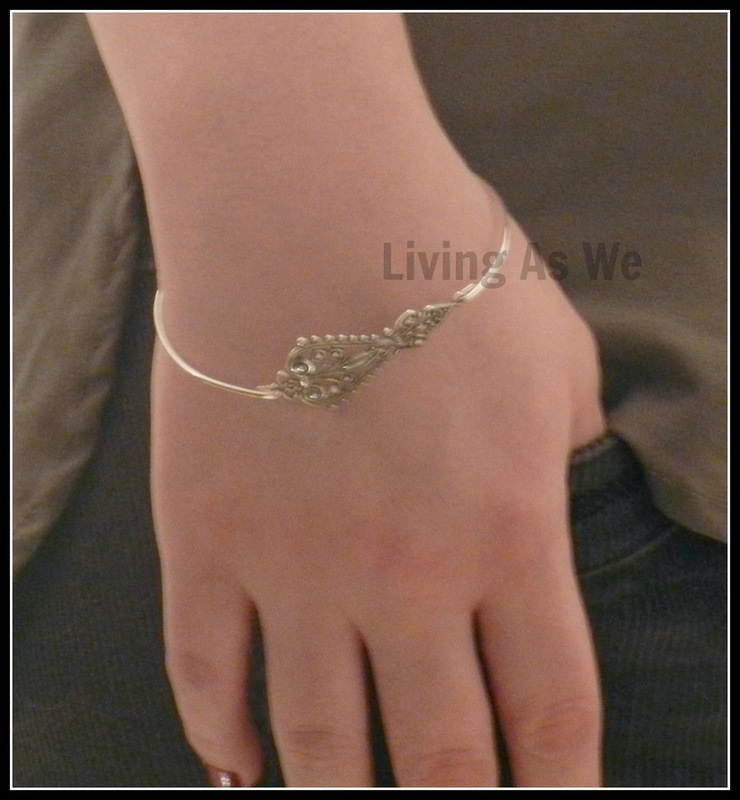 I really like the olive branch bracelet and the feather bangle. So pretty! I love the silver sand dollar and seahorse bracelets! I like the turqoise bracelet. The other one I liked was the tricolor hand stamped bracelet. These are very nice! I love the silver oakleaf! These bracelets are all so beautiful and dainty. I would probably choose the Paris Bangle Bracelet. I LOVE this set. It's the Romance-Bridal set. I would love to have it for my upcoming wedding. bumble bee bracelet. I would like to see anything with Christian theme. I am from Texas so I love the Texas bracelet. love the sweetheart elegant bracelet. I like the shooting star bracelet set. So cute! hi, i love the personalized angel bracelet w/ initial charm...this would be a great gift for my niece who will be going away to college in the fall! These are gorgeous! Would love to have some! The gold oval bangle bracelet with coral cabachon. 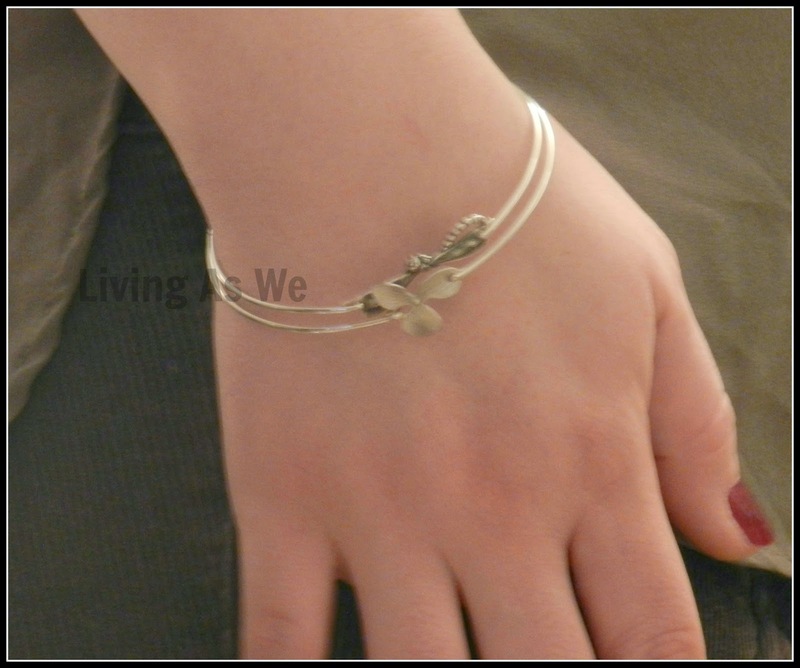 I love the Skinny Emima Bangle Bracelet in Silver. 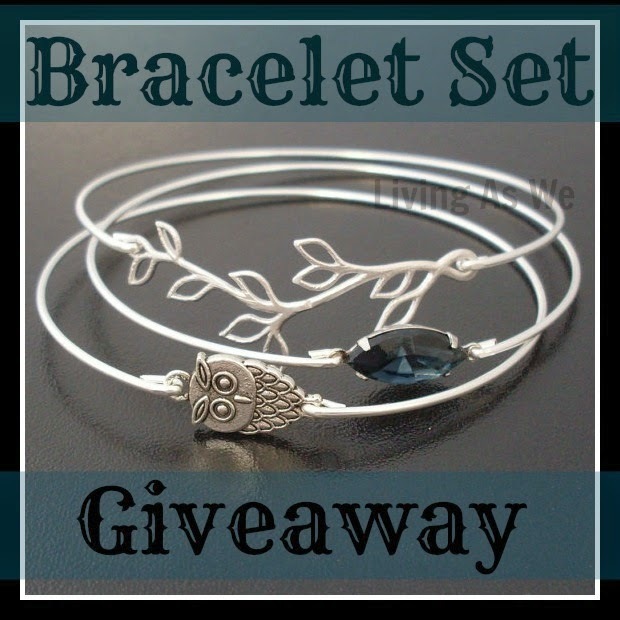 Love Love the Owl Bracelet Bangle Set! There are a few I would love to own; the silver anchor one caught my attention the most of all! such a huge selection! I'd like the "sailor ahoy" bangle set or the handstamped tricolor set! I like the Silver Infinity Bracelet. I really like the Infinity Style Personalized bracelet. Too hard to choose! I think the bat bangle is fun, and I like the infinity and yin/yang designs as well. I'm really tempted to buy a grab bag bracelet right this second! I would also like the Personalized Infinity Bracelet with Initials. Love the jewelry...handcrafted is my favorite! These are so beautiful! I love the owl and the branch! I would love to see any thing else with animal type jewlery like with giraffes or b irds.!! I really like the arrow of friendship braclet. I like the hanging initials. I like the Texas state, the yellow Amber, and Nautical Anchor! So many good ones!!! I really like the Romance - Silver Bridal Bracelet Set.